Women’s Mafia own Natsuko Matsumura is celebrating her first solo show! Starting this Friday she will present at exhibition of photography and mixed media at Gallery Bar – Brooklyn on Friday October 17th. 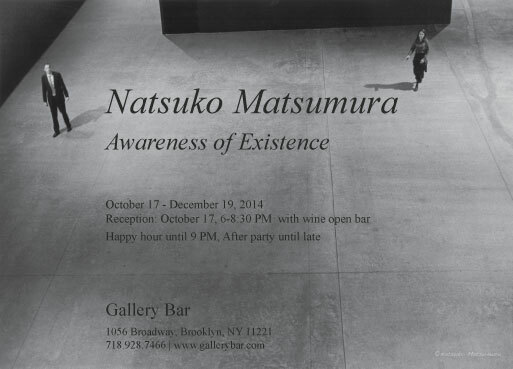 Gallery Bar is pleased to announce Awareness of Existence, the first solo exhibition by Natsuko Matsumura. She is a New York based international artist who received BFA in photography from Hunter College. Starting from 35mm black and white film photography, she expanded her use of medium to painting, sculpture, video, and mixed media. As soon as she started to take photographs on the streets of New York City, she found fascination in the relationship between people and the surrounding environment. Coming from Japan by herself, she has felt distance from people and had hard time to get closer to them. This feeling of isolation is the issue of the society especially in modern urban digital culture like New York. Her work deals with strange and sad behavior and disconnection of humankind in contemporary urban environment. Matsumura’s works come from the awareness of self-consciousness and struggling relations to other people in the society. Even her painting and mixed media, haunting and surrealistic images continue to convey watching and being watched by direct gaze and rise the awareness of the viewers existence.